Two attractions for the price of one! Meet the wax figures of your favorite celebrities at Madame Tussauds and then hear the stories of old San Francisco in the interactive San Francisco Dungeon. Both attractions provide visitors with a one-of-a-kind experience! From meeting San Francisco’s celebrities to hearing about the city’s infamous past, you don’t want to miss this much fun. Visit two attractions together and save! 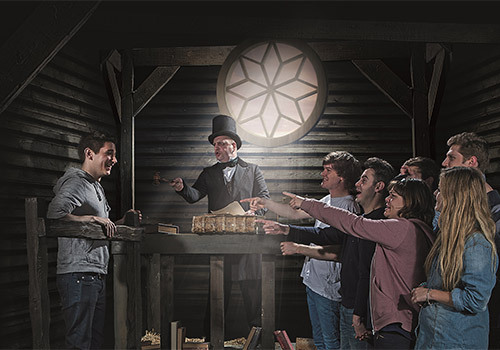 Meet the local legends and celebrate those who have created the true spirit of San Francisco at Madame Tussauds, then experience authentic stories of old San Francisco in an original, scarily funny walk through show at the San Francisco Dungeon. 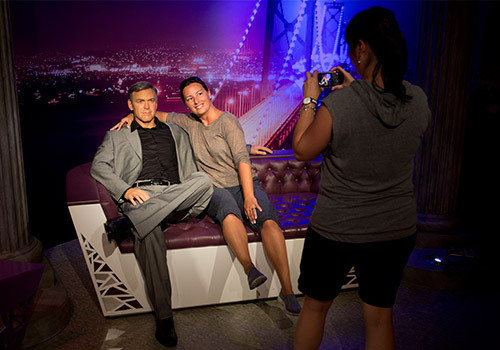 At Madame Tussauds San Francisco get ready to photograph and pose with your favorite A-listers, challenge sports legends, hop on stage with international pop icons and experience the true “Spirit of San Francisco”. This fun and unique attraction highlights milestone moments throughout history and in contemporary culture – both from around the world and in San Francisco. The San Francisco Dungeon, a historical and theatrical attraction popular in Europe, opened their first ever North America attraction in San Francisco during the summer of 2014. The hysterically horrible engaging stories take the visitor through 9 live actor led shows as they experience reenacted scenes from the colorful Gold Rush era to authentic tales about the Barbary Coast criminal gangs, Alcatraz, the Shanghai kelly boat show and more. The ultimate live action expedition! Through a storytelling journey, vibrant sets, authentic costumes and detailed make-up, The San Francisco Dungeon sheds a whole new light on San Francisco’s rich and authentic history. San Francisco’s unique background makes it the perfect location for the launch of the first-ever North America Dungeons Attraction. Located in San Francisco’s historic Fisherman’s Wharf, this unique experience will highlight 200 years of San Francisco’s colorful past with dramatic and theatrical story storytelling. The San Francisco Dungeon will guide visitors through theatrical sets on a walk-through journey. The recommended age for The San Francisco Dungeon is 10 years and above. Many children enter The San Francisco Dungeon and enjoy the experience, but please be aware it does get very dark inside the building and there are lots of loud noises. Children under 4 will not be admitted. 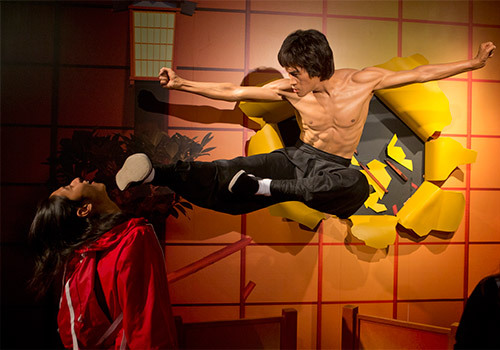 Have you been to Madame Tussauds San Francisco + The San Francisco Dungeon Combo? Share your knowledge and be the first to review this. Can I bring food or drink into Madame Tussauds or the San Francisco Dungeon? No. Outside food or drink is not permitted at either attraction. 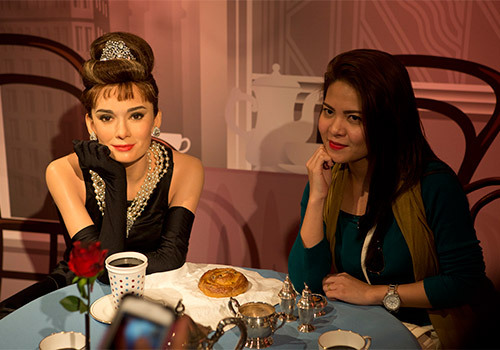 Madame Tussauds visitors may purchase concessions once inside the attraction. Are cameras allowed in Madame Tussauds? Absolutely. We encourage guests to bring cameras, camera phones, and/or selfie sticks to capture memories of their visit. 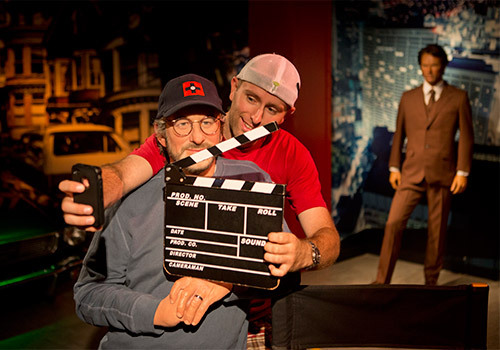 Cameras are permitted in all public areas of Madame Tussauds. Yes, the attraction is stroller accessible. If you prefer not to bring the stroller through the exhibit, please speak with a Madame Tussauds' hospitality host. 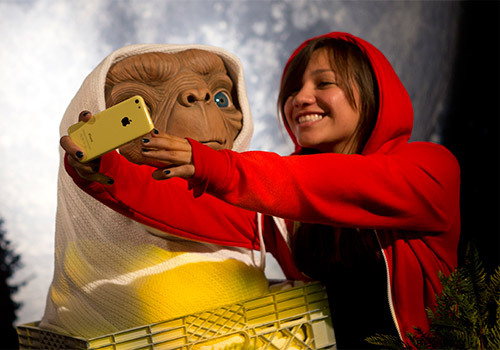 Please note that Madame Tussauds is not responsible for any lost, unclaimed, or damaged property. What are the hours of operation for Madame Tussauds? The San Francisco Dungeon is an interactive experience unlike any other. Made up of 9 shows, 360° engaging sets, incredible actors, and even a ride, guests won’t be able to describe what they just experienced! What is the age limit for the San Francisco Dungeon? 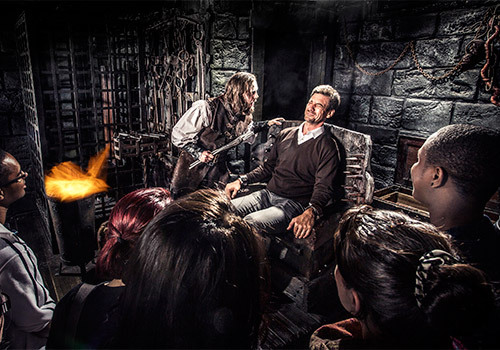 Due to the theatrical elements and themes involved in the attraction, the San Francisco Dungeon is recommended for children ages 10 and up. Children under the age of 16 must be accompanied by an adult at all times. Children under the age of 4 are not permitted into the attraction under any circumstances. If at any point, you need to leave the attraction, please alert one of our actors and they will assist you. What are the ride restrictions for the San Francisco Dungeon? The ride is not wheelchair accessible. Guests must be a minimum of 48" tall in order to ride. The ride is not recommended for guests with back injuries/pain, have recently had surgery, are pregnant, or has a condition or complication that will be affected by riding the attraction. 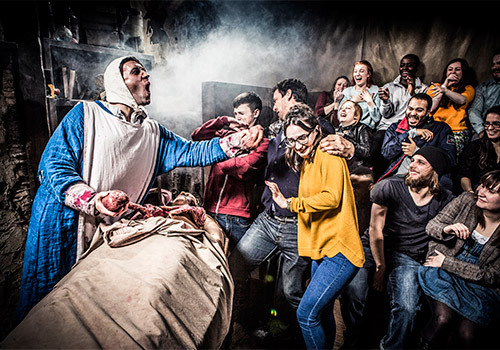 If you or a member of your group do not wish to participate in this section of the attraction for any reason, please inform a staff member who will help you bypass the ride and rejoin your group. What are the hours of operation for the San Francisco Dungeon?